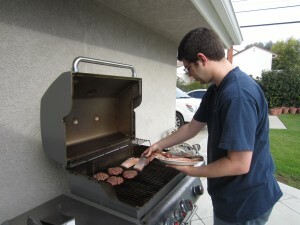 Kyle grilling on Christmas Day – don’t you love CA weather! This is our December review for our attempt to take control of our grocery spending through seven goals and a new grocery budget cap. In December we spent $502.54 on groceries, about 25% above our budget of $400. I don’t feel terrible about this overage because there were a few unusual circumstances, and I think we’re on track to meet our budget next month. We did pretty well accomplishing our goals aside from the time we were traveling. 1) Continuously keep a shopping list. I wouldn’t say that we continuously kept a list, but we started making one for each shopping day at least a couple days in advance. We don’t have a good system as of now as we’re just keeping it on my laptop and I have to write it out before going shopping. Now that I have a smartphone we’ll probably keep some sort of synched list between our two phones. 2) Track every single item we purchase and look at the aggregated data. Yes, accomplished! Unfortunately I’m not sure what to do with the data. Some points stood out to me but without baseline data or comparison with others I don’t know if they are actually odd. 1 – The $500 we spent was over 13 transactions on five shopping days. 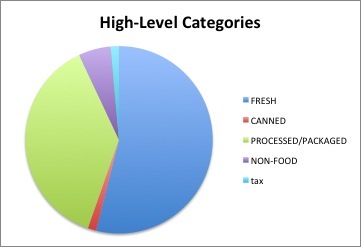 I aggregated the purchases into four categories – fresh, canned, processed/packaged, and non-food. Fresh food was our biggest expenditure but I was surprised to see that processed/packaged was close behind. 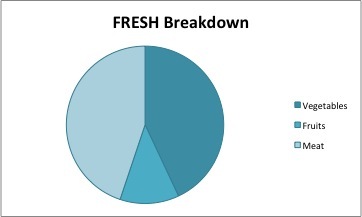 2 – I took a closer look at our FRESH category. We spent slightly more on meat than vegetables, but I expected there to be more of a difference. We do eat a lot of vegetables and I suppose we buy the cheapest cuts of meat possible. I’d like to spend more on meat but Kyle is opposed. 3 – Our processed/packaged category isn’t as bad as I had expected (in terms of spending a lot on grains). I think it’s revealing that we spent so much on dairy – it’s sort of a marginal category in my theoretical diet yet I obviously consume a lot of it. About 20% of the money we spent on grains/starches was on sweet potatoes and another 25% on grains largely for Kyle’s family so that’s about as good as it can get in that category. The only “barely-food” we bought this month was brownie mix and soda for parties. We spent way more than I expected on condiments and spices, but I think it was an unusually high month as we had to buy new oil and seasonings in bulk as well as some sauces for a new recipe. 3) Shop on a consistent day of the week. We accomplished this goal this month if you excuse our traveling – we only shopped on Saturdays for the first three weeks in December. There was one Wednesday when I strenuously argued with Kyle to go to the store mid-week but he stayed strong and said we would tough it out until Saturday. I actually think that forcing ourselves to eat down our fridge and pantry and get to the stuff we don’t like as much reduces waste and is limiting our spending. We shopped on a Thursday when we were in California and on the day after we returned to Durham (a Monday) so that still averages to once per week. 4) Check the weekly specials (and compare with my pricebook) to buy on sale. I only remembered to do this twice! But on those weeks checking the sales did change where I bought some of the items on our list so it saved us a bit of money. 5) Add in some meal planning. My goal was to cook four batch recipes but I only did three (although one of them was a double so it lasted a looooong time) and I only used the crock pot for two. The recipes were actually all new to us, Paleo chili, chicken curry (plus sweet potato), and one from the Smarter Science of Slim. None was totally amazing so I would definitely tweak the recipes if I made them again. 6) Visit low-cost stores first. We accomplished this goal. On each shopping trip we went to Costco followed by Kroger and then the more expensive stores. On one Saturday we went to the farmer’s market before Costco – I wish I had gone at least one more week. 7) Evaluate additional sources for groceries. I went to Trader Joe’s on the third Saturday. I didn’t plan to buy anything, just record some prices and see what selection they had to evaluate if it’s worth adding to our shopping regimen. I wasn’t there for terribly long but I did two passes through the baking section and was disappointed that I couldn’t find any non-wheat flours or coconut oil. Unfortunately the selection and prices didn’t seem compelling enough to drive to the next city for. All in all I think this was a good start. I would have liked to meet our spending cap in our first month of taking control back, but given our traveling that wasn’t really under our control. I have confidence that in January we can meet our spending cap by implementing these strategies. What do you do when you refocus to lower your grocery spending? How much did December’s traveling and parties throw off your food budget? 21 Responses to "Grocery Challenge Update for December 2012"
If you really want coconut oil, double check TJ’s. Ours always has tons and I know a lot of people that buy it there. Honestly, I probably won’t go back anytime soon. It’s a bit of a drive and parking was awful. I do have to double-check the Costco coconut oil prices to what I can find online, but the last tub I bought will probably last us several months. What a great write up! We like to eat a lot more fresh food than canned or prepackaged. We found that we started to spend a small fortune on fruit and vegetables though. Our solution – grow our own veggie patch. So far it is going great! Gardening is in the realm of possibility for us now that we’re living in a townhouse – the owner has a small garden area out back that has gone to seed. I need to get on researching how to grow food! I’d love tomatoes and squash since we eat so much of them. 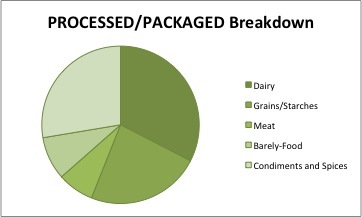 It is interesting to see your breakdown on what is spent where in the grocery store.. I don’t think we have ever taken our research down to that level..
One of our goals for this upcoming year is to spend considerably less on dairy.. I am hoping to replace a lot of my favorite snacking options (yogurt, cheese) with non-dairy items instead. When I was eating basically low-carb I ate tons of cheese and such but I’m trying to scale back now that I’m eating more whole foods. I’m focusing on protein and vegetables. Kyle still eats a decent amount of cheese but we might be able to go from Costco buying to grocery store buying. What a specific breakdown, that’s neat. I don’t really consider dairy and grains processed and packaged, but I guess with the exception of plain whole grains, most are. TJ’s may not have a lot of non-wheat flour but it’s good for frozen vegetables (unusual stuff like leeks and artichoke hearts, and bigger and less mushy chunks of more common stuff) and cheap nuts, cheese, and baking chocolate. If you run across an Ocean State Job Lot, they sometimes have a surprising amount of discounted non-wheat flours, but I’m not sure how regionally limited they are. This year I think meat is going to be my big temptation….we eat mostly vegetarian to save money, and because I have a lot of issues with the factory farm system, but it’s calling to me and reminding me how much I love it! I really, really want to start going to the farmer’s market and buying non-problematic meat, but the prices are insane (like $9-12+/lb last year, probably more this year), so it has to be a very rare thing. The dish we made to bring to Thanksgiving and Christmas Eve was shockingly expensive – lots of vegetables and cheese. It’s delicious but I don’t know if we’ll make it again because it is so pricey. That was a big component of our CA grocery spending. It makes sense to think of processed foods as a continuum – I buy a lot of milk, frozen vegetables, dried beans, rice, and flour, all of which require processing and packaging, but because I have to do work to make them into meals, and they don’t tend to contain any artificial ingredients, they aren’t usually what I think of as “processed food”. (At least compared to things like cereal that are really obviously processed.) I think if I went 100% for whole and fresh foods, I wouldn’t be able to afford it, and it would just be so time-consuming! In an industrial food system and urbanized setting, it’s really hard to do away with processing and packaging altogether. I’ve heard buying meat in bulk from local farmers is cheaper per pound, but we currently spend about $10/month on meat, so it would be an increase in absolute dollars. I am really looking forward to being able to buy a share in a meat CSA or bulk purchase if our incomes go up after grad school, though – the one element of lifestyle inflation I truly covet! Great write up! We spent more than normal because we had family visit and had to stock the kitchen for their visit. Thankfully we had some overage that was able to be applied towards it. We find that having a list and a meal plan is the biggest way for us to stretch our grocery budget. I think my mental barrier to meal planning is that I don’t know how much I’ll eat in a day. Do you keep extra food around for snacks for days when you’re more hungry? What if you don’t eat everything you planned to? Love the specifics and breakdowns in this post–you can learn so much at the granular level. I naturally favor veggies over meat, so my grocery bills are very low. I also take time to do my research before shopping so I know I’m getting the best deals for that week. Vegetables and meat serve two different purposes so I need to eat both. If I were able to change my life with a snap, I would eat more vegetables and higher quality meat and thus spend more on both. Have you tried ethnic stores? For example, coconut oil is very much cheaper in the India stores I go to instead of the regular grocery store. A lot of vegetables are cheaper in the Indian/Asian grocery stores. We don’t spend as much on groceries probably because we are vegetarians. Neat breakdown though. I should do something similar to see where we spend most. I intended to check out the Asian market that is near our house. It’s weird that I’ve never been there before, actually. I use TJs for meat. Their pre-brined chicken is awesome for roasting (I get kosher for antibiotic/humane reasons). It’s seriously impossible to over-cook. And they have antibiotic-free/non-cafo beef for a decent price, although we’re lucky to get grass-fed at the farmers market for $4-7/#. Also, they have a fairly rigid “sustainability” policy for their fish, which is generally $8-10/#. Costco has better prices on frozen fish of course, but researching the sustainability can be a pain. Thanks for commenting. I hadn’t heard of the non-cafo beef at TJ’s, would be awesome to find that for significantly less than at our farmer’s market (where it’s around $10/lb). I’ll take a look next time. I like that way of describing TJ’s. Thanks for the observations concerning the meat!